On February 26, 2010, the SANDAG Board of Directors accepted the Series 12: 2050 Regional Growth Forecast for planning purposes. This forecast is SANDAGâ€™s first projection of population, housing, land use, and economic growth to the end of the TransNet program in 2048. During the second stage, SANDAG staff develops a subregional forecast by working with local jurisdictions to understand existing land use plans. These land use plans then become an input to a subregional, or neighborhood-level, forecast model that utilizes data on existing development, future land use plans, proximity to existing job centers, past development patterns, and travel times to project where growth is likely to occur in the future. As directed by the SANDAG Board of Directors in July 2009, SANDAG staff provided a presentation on the 2050 growth forecast to each jurisdiction at a council, supervisor, and/or planning commission meeting. At these meetings, SANDAG requested each jurisdiction's assistance developing local land use scenarios beyond the 20-25 year horizon of most existing local general plans. Each jurisdiction provided a vision of their community beyond the horizon of their general plans. Upon collecting information from each jurisdiction, SANDAG staff produced a draft subregional forecast in early 2010. 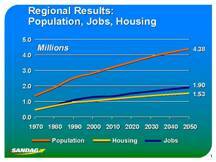 The purpose of the 2050 Regional Growth Forecast is to provide a starting point for regional planning. The forecast is not intended to be a prescription for future growth. Rather, the forecast is intended to show possible future development patterns based on regional projections and local input. The 2050 Regional Growth Forecast is one of the first steps in developing the 2050 Regional Transportation Plan (RTP), and it will inform the development of the regionâ€™s first Sustainable Communities Strategy (SCS), a new component of the RTP, and the Regional Housing Needs Assessment (RHNA) per California Senate Bill 375 (SB 375) (Chapter 728, Statutes of 2008). In addition, the forecast information will be used to evaluate future applications for the regionâ€™s Smart Growth Incentive Program and support local capital improvement and water resource planning throughout the region. The 2050 Regional Growth Forecast will also be used by SANDAG as the foundation for the next Regional Comprehensive PlanÂ update. SANDAG forecasts also are used by local governments for facilities planning, including the San Diego County Water Authority 2010 Urban Water Management Plan. This forecast complies with all applicable statutes and regulations regarding the RTP, SCS, and RHNA from SB 375 and the California Transportation Commission Draft RTP Guidelines.